By Melissa Lennig on November 16, 2012 4 Comments. This content contains affiliate links. As an Amazon Associate I earn from qualifying purchases. There is a direct correlation between cold weather and the phrase, “Mommy, I’m bored!” I actually believe it’s good for kids to be bored once in a while. After all, boredom births creativity! However, hearing about it over and over again is enough to make me lose my sanity! 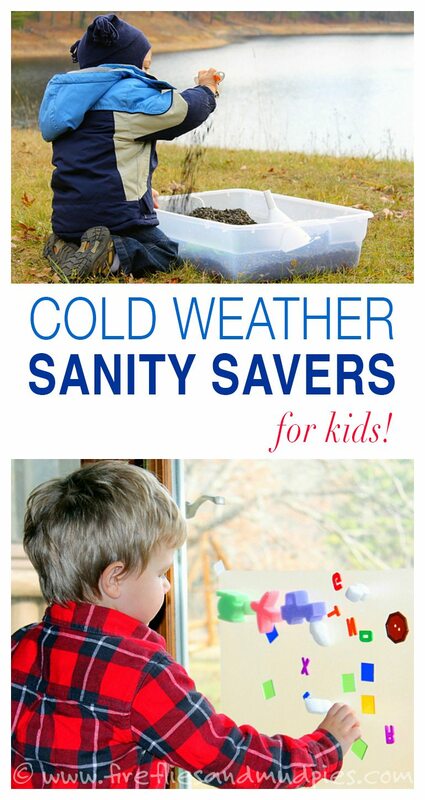 The following list of cold weather sanity savers might just be more for us parents than the kiddos! Tape a square of clear contact paper to the window (sticky side facing you). 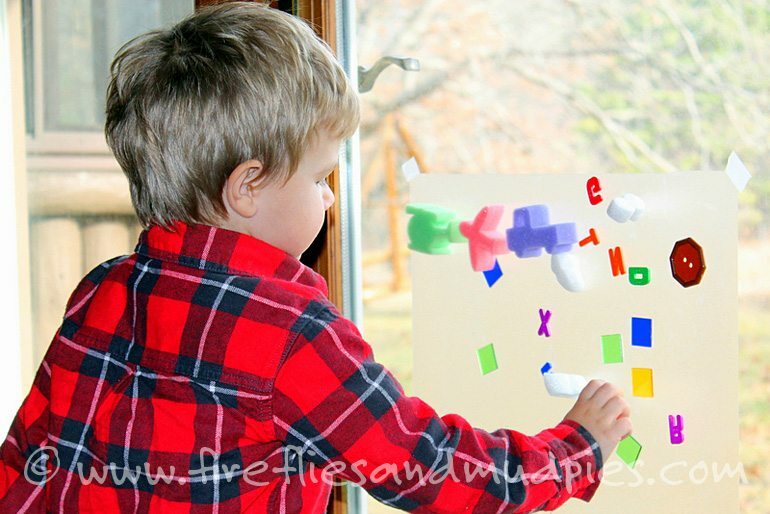 Invite your child to practice patterns or create scenes with craft buttons, clear tiles, pom poms, and anything else that will stick. My children love this activity! Magnets simply fascinate my children. Magformers are awesome and hold my boys’ attention for quite a while! Break out the craft supplies! Try painting with ice, stamping fingerprint comics, creating a cheerful suncatcher, or making homemade fingerpaints. 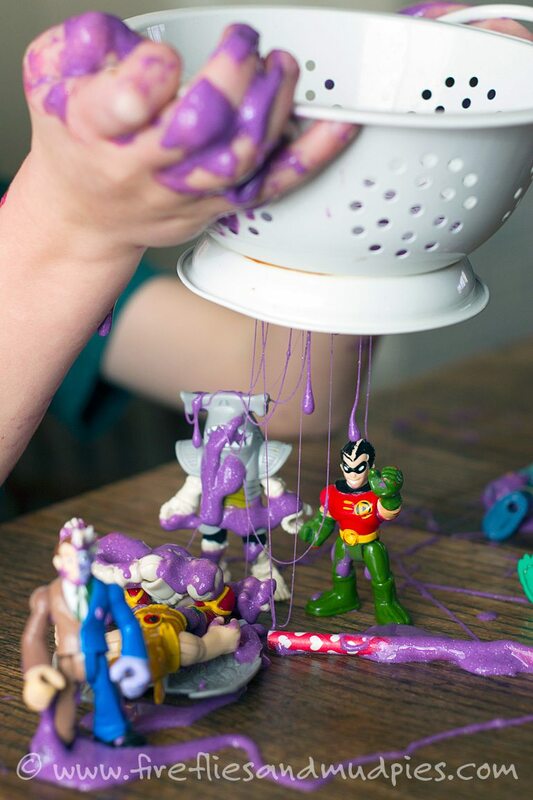 I have zillions of awesome slime and sensory play recipes pinned HERE. Check them out! Click HERE for creative homemade playdough ideas—perfect for cold weather! For added fun, invite your child to engineer with straws and playdough! Sensory bins are containers filled with objects that children can feel and interact with. We have a sticky sand bin, a rice and beans bin, a bird seed bin, and a kinetic sand bin that are rotated on a weekly basis. Mini construction vehicles, marble run pieces, ice-cream scoops, funnels, and measuring cups are just a few of the “accessories” that keep the bins fresh and exciting. Manipulatives kids can count and play with, like plastic links, keep little hands and minds occupied. Kids get stir crazy! If the weather is cold, bundle them up and send them out! They may enjoy sledding, blowing frozen bubbles, or going on a winter nature hike! How do you keep your kids busy on cold days? First of all I am so jealous that it has snowed there! All the photos with the games your kids play in the house look like they are having so much fun! Great suggestions, Melissa. I will definitely refer back to this for those days when everyone is going a bit shack-wacky!